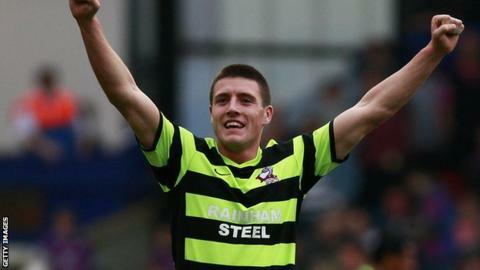 Rochdale have signed Scunthorpe forward Bobby Grant on a two-year contract for an undisclosed fee. The move re-unites the 22-year-old with boss John Coleman, who Grant previously played under at Accrington Stanley. He scored seven league goals in 59 appearances for the Iron after joining for £260,000 from Stanley in June 2010. "The pleasing thing for me is that Bobby didn't want to go anywhere else, he wanted to come to us," Coleman told the Rochdale website. "The chairman, Colin Garlick and the rest of the board should take a great deal of credit for doing this. "With this deal they have made the effort, they have shown that they really want to be successful, and Bobby is the type of player you need to do that." Grant could make his debut for the club in Saturday's home match against Barnet, with Dale looking for a first win of the season.